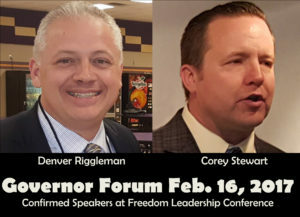 Candidates for Governor Denver Riggleman and Corey Stewart have confirmed to speak at the Governor Forum of Freedom Leadership Conference co-sponsored by Americans for the Trump Agenda on Thurs. 2/16/17 from 7 to 9 PM. 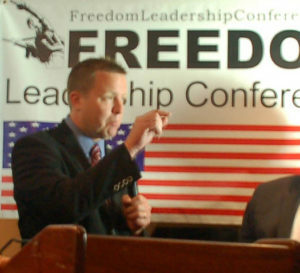 Showdown: Will Trump Conservatives Choose Corey Stewart or Denver Riggleman to Challenge Ed Gillespie for GOP Governor Nomination at Freedom Leadership Conference? Two candidates who are going all out to appeal to Virginia conservatives as the anti-establishment, pro-Trump alternative to the frontrunner for the Republican nomination to run for Governor in this year’s June primary will square off at a “Governor Forum” at the Freedom Leadership Conference this Thursday, Feb. 16 in northern Virginia. Conference co-sponsor Americans for the Trump Agenda asks the candidates to answer their question, “which of you would best help enact the Trump Agenda as Governor of Virginia?” Candidates Corey Stewart and Denver Riggleman have confirmed to speak (register to attend 7 to 9 PM conference for only $5 or dinner 5:30 to 6:30 PM HERE). Senator Jeff Sessions, nominated by President Trump to be U.S. Attorney, strongly supported by Americans for the Trump Agenda (TrumpYes.org). U.S. Senate to vote on Trump nomination of Stalwart Conservative Senator Jeff Sessions for U.S. Attorney General within the next 1 hour. Call your 2 Senators. The vote to confirm Senator Jeff Sessions as Attorney General is tonight (Wed. 2/8/2017) at 7pm. 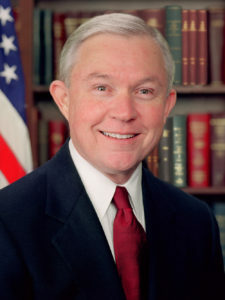 Call your Senators NOW – WITHIN THE NEXT 30 MINUTES PLEASE and tell them to support Sen. Jeff Sessions for Attorney General of the United States. 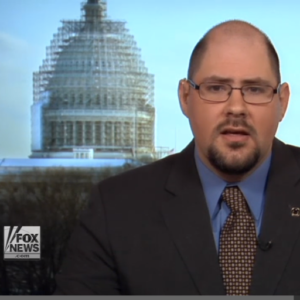 The sponsor of next week’s Freedom Leadership Conference, Americans for the Trump Agenda, says this is the highest priority for Trump supporters right now – to help put pressure on both of your Senators to confirm Sessions. 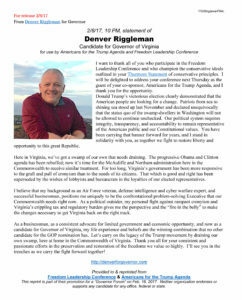 Candidate for the GOP nomination for Governor of Virginia Denver Riggleman, is announced today as a speaker at the Freedom Leadership Conference of 2/16 in Norther Virginia, sponsored by Americans for the Trump Agenda, aka TrumpYes.org. 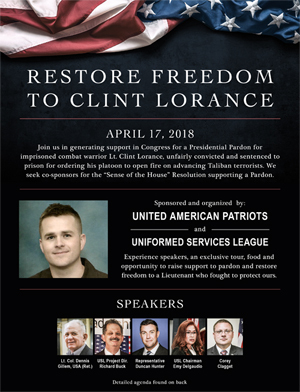 Candidate Riggleman Joins Corey Stewart as confirmed speakers Sponsored by Americans for the Trump Agenda at “Governor Forum” in Chantilly, VA Feb. 16. 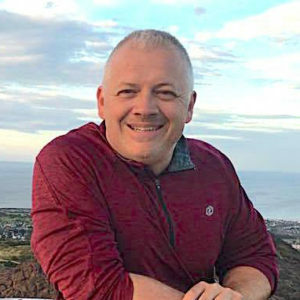 Denver Riggleman, candidate for the nomination for Governor in the Republican June primary, will address the Thursday, February 16 Freedom Leadership Conference that runs from 7 to 9 PM at the Wingate by Wyndham Hotel off Route 50 near Route 28 at 3940 Centerview Drive, Chantilly, VA, co-sponsored by Americans for the Trump Agenda. Statement of Denver Riggleman, candidate for Virginia Governor, upon accepting invitation to speak to the “Governor Forum” of Freedom Leadership Conference on 2/16/17. Yesterday it was announced that Prince William County Board of Supervisors Chairman Corey Stewart had confirmed that that he will speak at the conference, marking his second appearance. Candidate Ed Gillespie’s staff reports that the conference is on their schedule, while the staff of the fourth candidate, State Senator Frank Wagner, tells us that he is “trying” to put the conference on his schedule. The event requires advance registration for admission, whether it is for the 7 to 9 PM conference (doors open 6:30 PM) or the earlier dinner 5:30 to 6:30 PM (doors open 5 PM) for conference speakers and leadership. Register HERE. Conference Flyer HERE. (Early bird discount – save $5 per person or $10 for a couple for dinner, expires tonight Wed. 2/8). 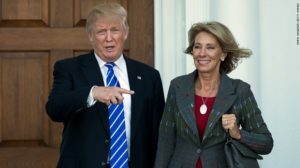 Betsy DeVos with President Donald Trump after she was announced as his nominee for Secretary of Education. All 4 candidates invited, Three tell us Conference is on their schedule, another candidate reported ready to confirm within next 24 hours, to tell us how as Governor they would help enact the Trump Agenda? FLC Leaders Invite Candidates to 2/16 Governor Forum (L to R) – (1) Conference Board member Ronald Wilcox invites Dan Riggleman wearing TrumpYes button of conference co-sponsor Americans for the Trump Agenda; (2) Conference Board Member & Event Coordinator Richard Buck invites Corey Stewart – both wearing TrumpYes button; (3) Wilcox invites Senator Wagner through staff member Kristen, wearing TrumpYes button. Three candidates who are reported to be out in front in the polls for the GOP nomination for Governor have told us our February 16 date to attend and speak at the Governor Forum of the Freedom Leadership Conference is now on their schedule as we continue in daily contact with their office, while State Senator Frank Wagner has yet to decide if he will accept our invitation. Two of our past supporters have stepped forward with a Host Committee Donation ($100) to help us pay for extra advertising and promotion for what we expect to be a full capacity crowd at the Wingate by Wyndham off Route 50 near Route 28 at 3940 Centerview Drive, Chantilly, VA, the new, better and expanded hotel we have been forced to move into after the last five full capacity conferences of 2016. There is priority seating for Host committee followed by those attending the dinner (5:30 to 6:30 PM, doors open at 5 PM), with a smaller number of seats reserved for conference-only attendees (only $5, begins 7 PM, doors open 6:30 PM), advance registration is required for admission, HERE. Four candidates for Governor. Choose one at 2/16 Freedom Leadership Conference. Advertising for the Governor Forum of Freedom Leadership Conference on February 16 has kicked in with two of the candidates for Governor telling our leaders that this event is now on their calendar, a third advising that he will confirm any day now. Which Virginia Governor would best enact Trump Agenda? The 2/16 Freedom Leadership Conference to be co-sponsored by Americans for the Trump Agenda, formerly Americans Against the Obama Agenda. 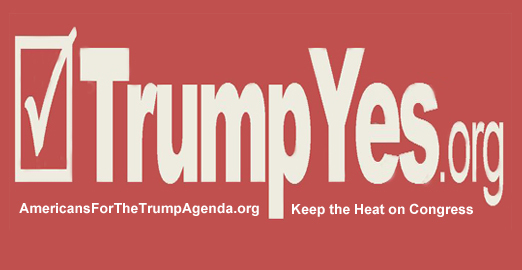 Free TrumpYes buttons & stickers will be given to conference attendees, or who attend 1/26 & who reserve their seat for 2/16. Americans for the Trump Agenda (AFTA), formerly Americans Against the Obama Agenda has secured approval to co-sponsor the Thursday, February 16 Freedom Leadership Conference and has invited the candidates for the GOP nomination for Governor of Virginia to take 14 minutes each to explain how they would help advance the Trump Agenda consistent with the ideals enumerated in the Thurmont Statement of Conservative Principles if they were to win the GOP nomination in the June primary this year and the election in November. There will be a secret ballot straw vote with the winner announced following the remarks by the candidates. The AFTA Virginia Governors Forum at Freedom Leadership Conference will be at the Wingate by Wyndham Hotel, Chantilly, VA from 7 to 9 PM (doors open 6:30 PM) and a pre-conference dinner with the candidates from 5:30 to 6:30 PM (doors open 5 PM) register to attend HERE – a full capacity crowd is expected and admission is by advance RSVP only.